What it’s like to be surprised by an unexpected divorce. How Facebook makes it easy to reconnect with people from your past and is becoming more and more related to reasons for divorce. How noticing your spouse’s strange behavior with his or her phone can mean something’s up. What it’s like to slowly get used to a new idea and new possibilities. How blogging became an unexpected source of healing, pleasure and community. What it’s like to drive long distances by yourself for the first time. How overcoming one scary hurdle at a time builds confidence. How pet sitting can be a perfect side hustle when you love dogs. Being blindsided by an unexpected divorce can turn your world upside down. This week my guest experienced this first-hand. Today’s episode features another interview in the Getting Real with Women in the Middle Series. I’m thrilled to welcome Lynne Ellen to the podcast. 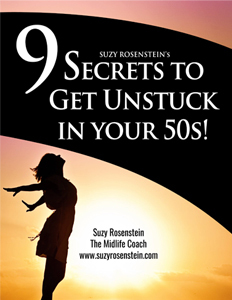 Lynne went from being a happily married midlife woman in Pennsylvania who was beginning to plan her pre-retirement move to Florida with her husband to becoming a divorced woman enjoying her single life near the beaches of Rhode Island. 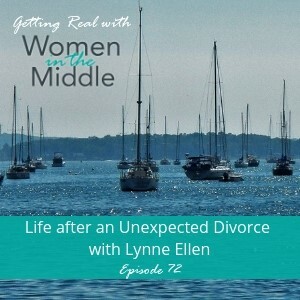 Lynne shares what it was like for her to experience an unexpected divorce. Soon after her husband left, she had to do some careful thinking, planning and coping to determine what her next steps should be. She found herself living alone in her home with her two dogs and cat and knew she would most likely be moving once she understood more what she wanted. She had so much going through her mind and had no close connection to her town, as it was where her ex-husband grew up. Fortunately, she worked from home and her job was portable. She slowly but surely got a handle on her expenses and understood what she could afford going forward. Lynne’s cousin suggested she should look at moving to Rhode Island, a five hour drive from where she lived. At first, the idea seemed impossible. Feeling stuck and overwhelmed however, she craved a change and gradually explored it. After several months of thinking about it and checking it out, Lynne eventually moved to Rhode Island and started her new life. Even though she had many hurdles to overcome, she found her own path to happiness again in midlife. The bottom line is that she now knows she is stronger than she ever imagined.